Tadoba National Park is a matchless spot to relish an unforgettable wildlife tour. This amazing national park located in the state of Maharashtra is no less than a paradise for wildlife lovers and nature admirers. The park encompasses a wide array of exotic flora and fauna species. The verdant and serene surroundings of the park make the wildlife lovers lost in nature's opulence. 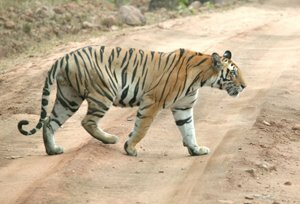 The 03 Nights and 04 Days Tour to Tadoba National Park is a great trip for the wildlife enthusiasts who want to explore the lush beauty of the park and witness rare wildlife species, especially Tigers. Safari in Tadoba makes the tourists come across the deepest secret of the Tadoba woods. On reaching Nagpur Railway Station or Airport, meet our representative and get transferred to Tadoba. It is located in Chandrapur District. One of the oldest and largest national parks in Maharashtra, Tadoba boasts some of the best jungle tracks. The park is bestowed with affluent biodiversity. Renowned for its natural heritage, this park is holds countless flora and fauna species including Tigers, Bears, Panthers, Jackals, Hyenas, Nil Gai, Barking Deer, Cheetal and Sambar. On arrival, check in the wildlife resort. Get freshen up and have the lunch. Further in evening, relish the nature walk. Dinner and overnight stay in the hotel. You will be picked by the jeep in the morning in order to have jungle safari. It is the best time to enjoy bird watching. You will also witness many other wild species. Return to resort after jungle safari to have the breakfast. Enjoy the lunch in noon and in evening, enjoy jeep safari in the park. 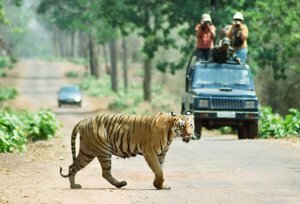 Tadoba is a heaven for wildlife lovers. Along with the tigers, the park provides a home to the Wild Boar, Leopard, Spotted Deer, Rusty Spotted Cat, Indian Mouse Deer, Sambar, Gaur, Sloth Beer, Four Horned Antelope, Flying Squirrel and so on. It was the 41st tiger reserve of the country. Get back to resort before dark. Dinner and overnight stay in the resort. On the second day, will keep continuing our wildlife adventure. For this reason, we will twice- in morning and then in noon. Enjoy the jungle safaris in Tadoba. Enjoy the dinner and overnight stay in resort. Enjoy the delectable breakfast and check out the resort for Nagpur. Arrive at Nagpur and get transferred to the airport or railway station for onward journey.